Few hours back evleaks tweeted the leaked image of a phone named ‘HTC First’ which indicated that this will be the phone getting unveiled at the event by Facebook on 4th April. Evleaks has always been true with the leaks most of the times and that is the reason leaks by them are taken seriously. 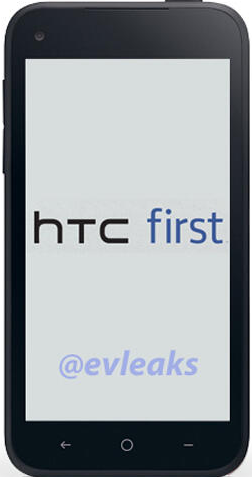 So, till the HTC Myst was being discussed among the sources to the Facebook Android phone by HTC turns out to be the HTC First. Now evleaks just talks about the image leaks they have not mentioned anything on the specs of the phone so we believe that the available rumors go fine with this new name of the phone, i.e. the size of the screen will be of 4.3 inches and you can expect it to be mid-range phone. As per the rumors they have not focused much on the hardware section as their main motto is that this phone should be reachable to most of the users who are active on Facebook and thus they are more bothered about the new Facebook skin of Android which will be seen on that phone and which will be responsible for more integration of Facebook account in your life. The phone will have 5MP of primary camera and 1.6 MP (VGA) of secondary camera, now these 2 can be just to make sure that people should be able to share any photo on their account or with their friends or they should also be able to utilize the new calling feature introduced in Facebook messenger section. As we can see that Facebook has worked a lot on the applications for iPhone and Android and their list of applications starts from Facebook Poke, Facebook, Facebook Messenger and Facebook Page. Now combining all these applications you can do anything which you do on Facebook desktop version through your smart-phones and it has been reposted with the stats that users are more active on Facebook through their smart-phones rather than doing the same on their desktop. Again, the phone will not have much power as it will have Dual Core processor at its heart supported by 1 GB of RAM. When you take a look at the Facebook integration with Windows Phone 7 then a normal text message and Facebook message for a person comes under a same log (which is confusing though) but it is an indication that HTC First may have such feature on its phone. Well, there are many questions running up in the mind which will be answer at the event on 4th April and we will help with the live coverage of that event. Stay tuned with us at 10:00AM PST on 4th April.